238 pages | 3 B/W Illus. The Tokyo International Conference on African Development (TICAD) was established in 1993 with the intention of creating opportunities for trade and investment on both sides and the promotion of sustainable development. In 2003, the conference translated Japanese aid policy to Africa into three key pillars: human centered development, poverty reduction through economic growth, and the consolidation of peace, and since 2005 Africa has on several occasions been the largest recipient of Japanese overseas aid. 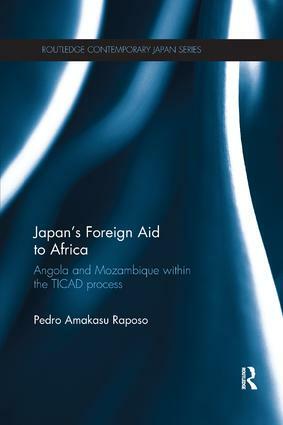 Tracing Japanese foreign aid to Africa during and after the Cold War, this book examines how the TICAD process sits at the intersection of international relations and domestic decision making. Indeed, it questions whether the increase in aid has been driven by domestic changes such as demands from civil society and donor interest, or pressures emanating from the international system. Taking Angola and Mozambique as case studies, the book explores how Japan’s development cooperation with Africa has assisted previously war torn states make the transition from war to peace, and in doing so demonstrates the centrality of human security to Japanese foreign policy as a means of ensuring sustainable development. This book will have great interdisciplinary appeal to students and scholars of Japanese and African studies, Japanese politics, international relations theory, foreign policy, economic development and sustainable development. Pedro Amakasu Raposo Carvalho is Assistant Professor at Lusiada University, Portugal.